When and why did you first become interested in gymnastics? I became interested in gymnastics when my mom put me in classes because I was very active at home. When I realized there was a place I could let all my energy out, I didn’t want to stop. Do you have any good/funny memories from when you first started taking gymnastics classes? When I was in the kinder classes and we were doing forward rolls down the mat, I would always take my turn, then run back to the top of the mat to go again. The teacher constantly had to tell me it wasn’t my turn. When did you decide you wanted to compete? And, when did you want to compete at a high level? What about competition appeals to you? The coaches told my mom that they thought I had potential and at the time I decided that I wanted to spend more time with my friends at the gym. I decided that I wanted to compete at a high level when I witnessed how rewarding success was. To this day, it’s one of my favorite things about competing: hard work paying off and being with my team. What is your training regimen? Was that a big change when you made the switch to competitive gymnastics? My training regimen as of now is different from what it used to be. Since we don’t have as many hours in the gym, we utilize every minute. Practice is like a cardio workout. This was a huge change when I made the switch to competitive gymnastics because I wasn’t used to practice being so mentally and physically demanding. What music do you use for your floor routine? It’s an early 2000’s hip hop mix. It has Poison by Bell Biv Devoe, then transitions into the “Everybody Hates Chris” theme song. After it goes to Candy Shop by 50 cent then goes back to the “Everybody Hates Chris” theme song. 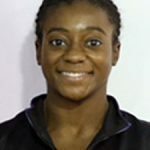 Who is your favorite gymnast or who is your “idol”? Emma Mclean in my all time favorite gymnast. I know her personally and admire her composure and work ethic. 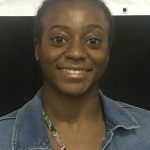 How have you grown as a gymnast during your career, both skill wise and mentally? I’m a lot more confident in myself and I trust my body to do what it knows how to do. I’m a lot happier and I allow gymnastics to be my stress reliever instead of a stressor. Skill wise I have grown through perseverance and persistence. I always tell myself it’ll come and to trust the process. How has gymnastics helped you as a person? From being part of a team, gymnastics has taught me to be selfless. You need your team and your team needs you. So, it’s important to always be there for eachother. Nothing you do or say only affects you. It impacts the entire team. So you have to make sure you’re making a positive impact. If you had to select one life-lesson that gymnastics has taught you, what would it be? Gymnastics has taught me that it’s exhausting to get frustrated with yourself. You have to be able to forgive yourself for making mistakes. YOU control your attitude, no matter what. All you can do is give 110% everyday and not get discouraged if everything doesn’t go your way. It’s a lot easier to smile and laugh than get down on yourself and laughing is way more fun anyway! What are your biggest accomplishments or best memories in your career? My biggest accomplishment is getting a full ride scholarship to The University of Michigan. My favorite memory so far was my first day at Olympia. I was so nervous and didn’t know what to expect but I was so excited for what was to come. Do you want to compete in collegiate gymnastics? Yes! GO BLUE!!!! What are your favorite subjects, etc.? English; I love writing. If you plan to go to college, do you know what you want to study there? I want to study Business. Entrepreneurship specifically and minor in dance. What are your goals for the future, both as an athlete and after you are finished competing? I want to help U of M win the Super Six championships. After college I want to build the world’s largest food court and be a performer. When you’re not in the gym, how do you enjoy spending your time? Do you have any hobbies or favorite activities? When I’m not at the gym I like to dance, sing, watch movies, sleep, cook and spend time with family and friends. What is your favorite music group? I don’t have a favorite but I like Post Malone, Nicki Minaj, Jeremih and Drake. Are any of your family members current or former athletes? Which sports? Both my parents were All American collegiate track runners and my younger sister is into everything (basketball, volleyball, cheer, cross country etc) and my older sister used to do competitive cheer. Do you have any competition rituals? Lucky charms? I always pray. What’s on your IPod right now? What type of music do enjoy listening to? How about before a meet when you’re trying to get focused and pumped up? Right now I love The Greatest Showman Soundtrack. I listen to it all the time including before meets and it always puts a smile on my face. If you had to pick 3 words to describe yourself as a gymnast, what are they? Happy, confident and focused. A: I was very active at home, and my mom didn’t want me to get hurt, so she signed me up for classes to get out all my energy. A: I cried at a class because I couldn’t do a forward roll. I guess I’ve always had high expectations of myself. A: I love competing. Succeeding is the best feeling in the world. 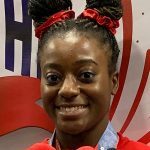 A: I have to say, Laurie Hernandez. She is so mentally strong and loves what she does. A: Gymnastics has helped me realize how blessed I am. I know it’s important not to take ANYTHING for granted because when you look around you and see what people around the world go through it makes you thankful for what you have. A: Everything gets better no matter how bad things seem. I’ve gotten into the car balling my eyes out and not knowing what to do after a bad practice. Even when it seems hopeless, it always turns itself around; you just have to have faith. A: Getting a full ride college scholarship and making friends from all around the country. A: I’m in tenth grade and go to Skyline High School in Ann Arbor. A: YES! I’m committed to the University of Michigan. GO BLUE!!!!! A: I’m thinking about going into business and possibly create the largest food court in the world. A: My goals are to live a healthy lifestyle number one. Also, to contribute positively to MI’s gymnastics team and to be independent and to have a job where I can choose where and when I want to work. A: I love doing crafts, dancing, singing and cooking. A: My parents were All-Americans in track and both my sisters did competitive cheer. 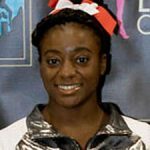 Gabryel Wilson 14, Ypsilanti, Mich. I was very energetic and loved to jump and play around. I thought of gymnastics as a way to let out all my energy and also meet other kids who were active like me. In my first class as a toddler, my coach Jeanette Nemmeth was spotting me on forward rolls and I had to go the next mat to do it by myself. After I went by myself, I started crying and Jeanie came up to me and said, “What’s wrong?” I was crying because I didn’t think my forward roll was good enough. I guess I’ve always been my hardest critic. I decided to compete when I was in Level 4, and I saw all the other team girls doing the bigger skills. I had always been so inspired by them. I love to compete because I get to see all my friends from other gyms, and I get to show off what I’ve been working on. Also, it’s a chance to see all your hard work pay off. My training regimen is confidence, consistency and calmness. Also, my victory scriptures my dad gave me. They talk about how I conquer and how I’m victorious through God who loves me. 8. What is your event? My favorite event is floor. 9. What is your skill? My favorite skill is a double layout on floor. My music is dark, mysterious and fierce and that’s how I see myself. It has taught me all about determination, perseverance and hard work and most people don’t get to learn those virtues until they’re adults. You can’t get discouraged when every little thing doesn’t go your way. However, when you give 110% at whatever you do, but keep in your mind not everything is going to go perfectly, that’s when you have your greatest victories. I’m in the ninth grade and go to Skyline High School in Ann Arbor. Yes, I’ve been told it’s very fun, and I look forward to it in the future. I want to go as far as I know I can. I also want to know what I want to be when I grow up because right now I’m not actually sure. I love to learn dances from YouTube choreographers and I love to sing too. No, I just go over my scriptures with my dad.